This is our fifth episode covering the events of the German Spring offensives, and last episode the first major German attack on the Western Front, Operation Michael began. Throughout the day on March 21st the German troops had moved forward and for the most part they had done quite well. Today we will try and pull back a bit to discuss how well the attack was going and discuss some of the decisions that were being made back at German high command which would completely change the direction of the attack. Then we will switch over to the British side of the line to talk about how they were reacting to the German attack, and what they were trying to do to attempt to slow down the seemingly unstoppable German advance. Finally, while decisions were being discussed by the British and German commanders back at the front the troops were still attacking, and we will discuss their actions on the night of March the 21st and beyond. The German attack had been a sucess during the first day, but it had not gone exactly according to plan. On the German right, or in the North, von Below's army was supposed to be the spearhead of the attack. Their goal had been to punch through the British lines and then be on their way to Arras and Albert. This is not what had happened. Instead they had only advanced between 4 and 5 kilometers. 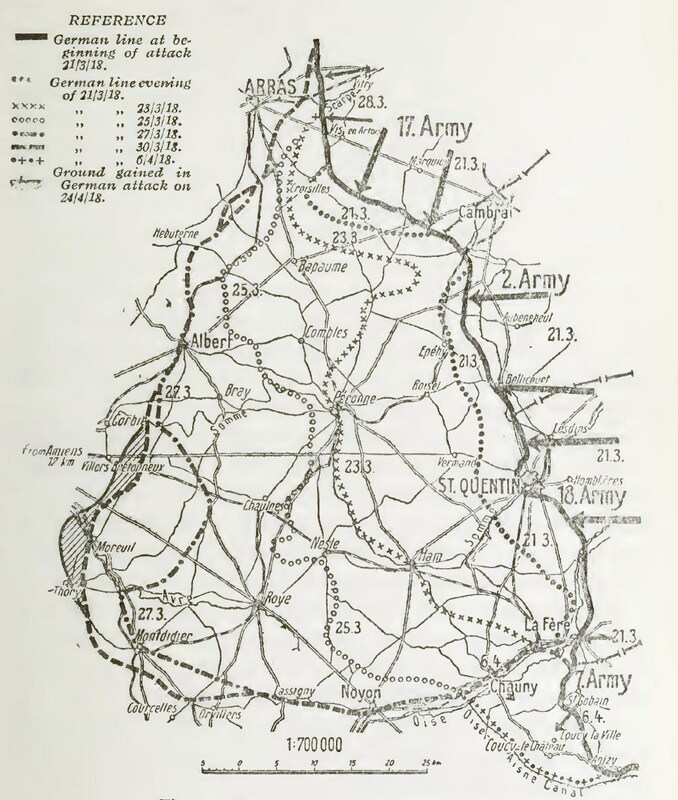 In many places the German troops of Below's army had been fought to a standstill in or near the British Battle Zone, which was supposed to have been all captured in the opening push. There were many reasons for these disappointing results. It was on this area of the front that the British were most prepared for the attack, having been in possession of this area of the front for years. The German bombardment had also been less effective against the stronger British defeses. Perhaps most importantly the fog that had been present over the entire front was thinner in the north. This meant that it had burned away faster which reduced its utility for the attacking troops. If this had been the only area of German attack the situation would have looked very bad, but there was a great success, but it was all on the German left, and in the South. As originally planned the 18th Army on the German left wing was simply attacking to provide flank protection to the real gains that would happen further north, but it was here on the left that the German experienced their greatest successes. Many historians put some of this success on the shoulders of officers like Hutier and Bruchmuller, who had been so pivotal in the creation and refinement of the new German attacking doctrine, but there were also many reasons for the success that were completely out of their control. The fog, as previously mentioned, was thicker and longer lasting in the south, providing cover for the attacking troops almost until the middle of the day. The artillery bombardment had also been more successful and effective against the weaker British defenses, finally the British were just spread so thin on this area of the front that resistance was almost impossible. This had been the area that had been taken over from the French and the British defenders had both run out of time and manpower to create strong defenses, and they had paid for it. While the Germans loved successes, with the only real success happening in the south they were in a bit of a jam. There had been plans and preparations made for what to do when the norther attacked succeeded but those similar preparations had not been man for in the south. So the question now became, what would they do next? While the Germans had been able to create a large mass of troops for the attacks their reserves were not unlimited, and they only had a small set of divisions, especially the highest quality ones, that they wanted to commit to the fighting. The original plan had been to feed these reserves into the norther German attacks as the offensive developed, but now they had to pivot and instead all of the best troops were sent to Hutier in the south. This is a decision often credited to Ludendorff, and it has drawn some criticism over the years. On one had reinforcing success instead of failure was completely in alignment with the new German offensive doctrine. From small units all the way up to armies their entire goal was to keep pushing troops forward to keep the attack moving. In this scheme it was believed that keeping a successsful attack going was more important than where it was going. This generally worked quite well at a tactical level where outflanking and destabilizing portions of the line were possible, but on the army and army group level it generally draws more criticism. If the Germans continued their advance in the south they would be advacing into, well, nothing, not nothing but nothing really important. It was here that they would be marching into the area of destruction caused by the German retreat to the Hindenburg line in early 1917 and then the heart of the old Somme battlefield. neither of these areas would be conducive to large scale troop movements due to the damage to the roads, bridges, and just overall infrastrucutre that had been caused by years of war. But this is where the Germans, led by Ludendorff, decided to advance and while so far the attack had not been the success that they had hoped for, it was the one that they had, and Ludendorff down they hoped that they would now be able to take advantage of it. While the Germans were grappling with how best to capitalize on their successes, a very different discusion was happening on the British side of the front. The British had just suffered their greatest defensive defeat since the end of 1914. Along the entire front of the attack the entire set of forward positions had been captured. On the far right Gough's entire battlze zone, and his artillery line, was now in German hands. Hundreds of pieces of artillery had been captured and in almost every way the Germans had broken through the British defenses. 7,000 British infantry had been killed, 21,000 had been taken prisoner. Critically, the British kenw that the German attack would continue, and they could only assume it would continue along the entire front, this meant the British commander had to determine how to respond to it. While the southern end of the British front had basically collapsed, in the north things were looking better. North the Flesquieres Salient the troops under General Byng had performed well, he had also been able to bring in some reinforcements. Three divisions were already on their way to the front on the 21st and they would be in position to meet any renewed German effort on the 22nd. They ha not fully stopped the Germans on this area of the front, but they had at least slowed them greatly. Here is Martin Middlebrook from The Kaiser's Battle to give a more precise rundown of what had happened on this area of the front "Parts of four divisions in General Byng’s Third Army had opposed the main force of the German attack north of the Flesquières Salient. Two large wedges had been driven into the positions of these divisions. 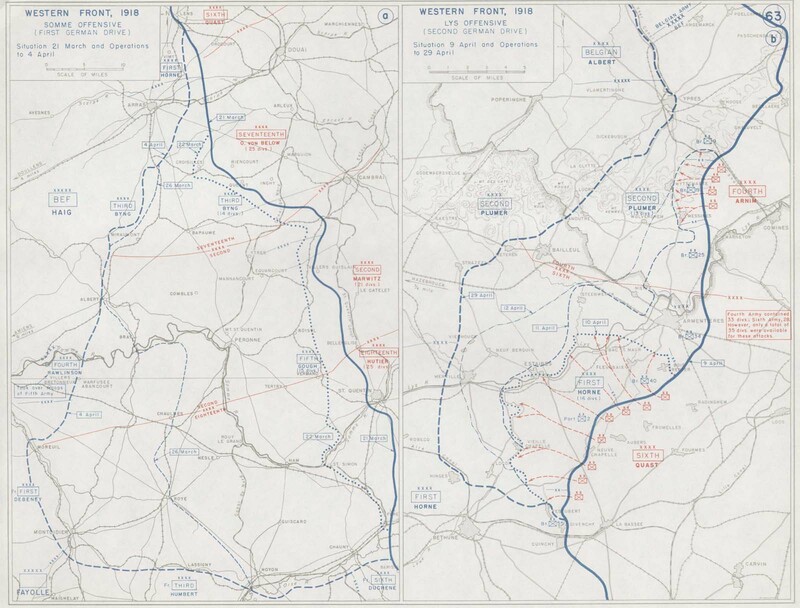 The right-hand brigade of the 34th Division and the whole of the 59th (North Midland) Division had been pushed right back to the rear edge of their Battle Zones, and, farther south, the 51st (Highland) Division was in a similar situation. Between these two wedges, the 6th Division was still fighting inside its Battle Zone but its troops were exposed on both flanks and would have to withdraw during the night to maintain a line with the units on either side." So while there was a lot of fighting still occurring in many areas of the front the British defenders still held onto good solid defenses. South of these troops was the Flesquieres Salient, which had still not been attacked in any strength by the Germans. Along the area of the front almost all of the troops were either still holding all of their battle zone defenses or had stopped the German attacks within the zone. There had been several casualties in this area mostly due to the amount of gas the Germans had dropped on the British positions. With the situation to the north and south, a decision had to be made about the salient. Even though the troops within it had done seemingly very well they had always been occupying positions jutting out into the German lines. Since the beginning of the attack, and with troops retreating to the north and south, especially in the south, the positions within the salient were in serious danger of being cut off, and if that happened whole divisions could fall into German hands. Because of this concern Byng authorized the retreat of the men on the forward edge of the salient, a retreat of about 4,000 yards or a bit over 2 miles. This retreat would be executed during the night of March 21st. We now move to the south of the salient, where the real disaster for the British had occurred. Troops in this area had always been at risk,a nd there were plans made for them to trade space for time, maybe not quite as quickly as was happening though. The front line positions had been expected to hold for 2 days, but by the end of the first day many had already been overrun. Most of the troops in this area had been completely pushed out of their Battle Zone defenses and large gaps had developed as units pulled back at different times and varying distances. Gough had committed most of this reserves, a dismounted cavarly division, the 20th Light Infantry, and the 39th Division and while more divisions would be arriving soon, the next division, the 50th, would not arrive until the morning of the 22nd. While more troops were always accepted Gough was in a bad spot because there was not a great position in which to put them. With so little of the reserve line of fortifications completed it was difficult to find a spot for the men to make a stand. Any kind of coherent defense without good fortifications would require vastly more men than were available, especially when considering the number of German troops in the attack. The decision was made late in the day of the 21st to order a retreat along the entire sector of the front. The length of the retreat varied based on the area of the front, in some ways they would retreat all the way back to the River Somme, 10 miles behind the initial front. This was done because it was the only way in which Gough could keep his army in any kind of fighting shape. Even then he was not exactly optimistic about his chances of renewing resistance. After making a report to Haig's Chief of Staff General Lawrence, Gough would write that "I told him of the number of divisions which the Germans had brought into action against us and the masses still in the rear. I then went on to express very considerable anziety for the next and following days. The Germans would certainly continue to push their attack ton the next day, Friday, and it woudl undoubtedly continue with unabashed fury for many days. Could our tired and attenuated line maintain the struggle without support?" Gough would be criticized for ordering such a large surrender of territory, but he would be supported in the decision by Haig. It should also be noted that the French, having promised to provide assistance if the Germans attacked, began moving quickly to assist. Once they were satisfied that the Germans were not planning a large attack in the south troops began to move north to help gough and the British. The first divisions would begin to arrive as early as March 22nd, and there were many more on the way. They would first take up positions along the southern end of the German advance to try and maintain some continuity with the British as they fell back. Next episode we will discuss in far greater detail the discussions occurring about these French troops and the attempts at coordinating the defense, but for the troops at the front on the night of March 21st, all of those discussions were in the future. When night fell on the battlefield on March 21st it was at the end of a very long day for the participatns. The German troops had been fighting their way forward all day and as dusk arrived many began to settle down to try and get some rest before starting the advance against the next day. Many woould spend the night in British positions, some of which had quite the bounty of food for the hungry German troops. Here is Gefreiter Willy Adams of the Lehr Infantry Regiment "After having made some sort of a trench, we entered the hut. What we found was a gold mine for hungry soldiers. I think it was a store room. There was corned beef, tins with cooked dinners that only had to be warmed, choice jams and marmalade and other foodstuffs – things we hadn’t seen for years. What a difference from our food! We just stuffed ourselves. I found a tin with 100 cigarettes; they were the best I have ever smoked in my life. We opened every tin in sight because none of us could read English. I especially remember a tin with baked beans and pork. I enjoyed that very much." While many German troops stopped to prepare for the next day, troops behind the front continued forward. This included moving forward as much artillery as possible. Here is Pioneer Wilhelm Niebuhr of the 27th Pioneer Battalion "There was never any rest for us. Some of the artillery horses had been killed by shellfire and we received orders to help get these guns forward before morning. We had no meal. The artillerymen had no meal. We were all fed up with this lousy job and there was a great deal of swearing between us before the night was over." There were also some troops that were neither staying or moving forward, but were instead moving to the reat. With the first attacks complete, and the line pierced in many places, some of the best German troops, the stormtroopers and Jager battalions, were already on their back to billets behind the lines. They were now destined to move north and prepare for the next large Germana attack in Arras. This was also true of some of the heavy artillery on the northern side of the German attack. The initial plan had been for artillery on the southern side of the attack to move north after the first day, but with the shift in German focus it was now the northern guns that would be moved for the next attacks. They only had about a week to prepare for the Arras attack, or at least that was the plan on March 21st, and it meant that the guns had to be on the move very quickly. For the British troops most of the night was spent retreating along the entire front. The largest of these retreats was in the south, and here men from four divisions were pulling back, with similar movements happening the Flesquieres Salient. Given the general state of confusion at the front it took time for all of the units to get the appropriate orders to retire, and some were already preparing to continue the defense of the line the next day. Here is Captain P. Howe of the 10th West Yorks "It was customary for company commanders to send in a report of the day’s events, so I went to a dug-out to write it and had a cup of cocoa. I must have been tired because I went to sleep but was wakened in a few minutes by a messenger. As I looked up, I saw a small mouse balanced on the rim of the cocoa mug, having a sip! The message was to the effect that the enemy were behind us on the right and left and I was to retire as quickly as possible – to Havrincourt I think – destroying everything as I went. The first obvious thing to destroy was the dug-out, so I threw a phosphorous bomb into it in order to set fire to the timber stairway and the framework of the dug-out As I did so, I thought, ‘poor little mouse’. I didn’t have time to see if the fire started. We formed the company up on a road and marched back to Havrincourt. It was a very orderly retreat – at least it was that night." While many front line troops were retreating, behind them many units were moving up to provide assistance in the defense the next day. Sometimes this came in the form of replacements, like Private Walter Hair of the 31st Division, he was moved up from a replacement depot behind the front, and was not exactly optimistic about his skills in fighting "The sort of training we did wasn't a scrap of use to us when we got to France, because the only thing we learned was to slope arms and salute and things like that. You don't slope arms when you're in the trenches, and you don't salute officers when you're in the trenches. You've something else to do. I did fire five rounds from a rifle, but I was never told where those five shots went to." There had also been reinforcemetns moving up throughout the day, and officers trying to keep those moving back in order, one of those officers was Second Leiutenant E. Hakewill-Smith of the 30th division "I collected some off men coming back, and this brought the strength of the platoon up to about sixty. I was lucky enough to get hold of a stray Vickers machine-gun and its team, and I also got another Lewis-gun off one of our aeroplanes, which was forced to land near my trench. This meant that I now had 3 machine guns and about 60 rifles and, but for the fact that my trench was unwired, I should have felt very confident" [after a bit of an attack] "I hadn't liked the situation in the least for the previous 15 minutes. None of our field guns had been firing, and I heard no rifle fire either from the rest of my battalion or from the battalion on my right, and I knew that if they had still been in position they would have been fighting hard. But my orders were to hold on to the last" [after more attacks] "The Boche had nearly joined up around us. We couldn't withdraw to our rear, so we slipped off to our right rear. Naturally, as weleft the trench, we came under rifle fire and machine-gun fire, and they also got a couple of guns on to us and sprayed us with high shrapnel, but by a miracle we got across the open only dropping about a dozen men, who most unfortunately had to be left" Along with the infantry the artillery was also caught up in a cycle of retreat and defend with Sergeant A. Dunbar of the 236th Battery taking part "After we had fired all our ammunition we were ordered further back and into another field for the night and to replenish our ammunition. A couple of dozen wagons of live shell had been ordered from the divisional ammunition column, and our CO had also asked for a dozen empty wagons to recover the piles of empty cartidge cases that we had left at our last gun position in our hurry to get away. The empty wagons duly arrived, and I was detailed to act as guide back to the old position. I was not amused. At the time we got our guns away we thought that least a whole battalion of German infantry were in the next field, and it seemed madness to try to recover those cases. However, orders is orders, so we started back"
With the British retreating the attack resumed on March 22nd. Once against there was fog over the battlefield which helped the Germans to continue their advance. Many of the British units now found themselves out of their prepared positions which made it even more difficult to try and halt the German attacks Private Alex Jamieson was in a unit that was moved forward to try and held defend what was theoretically a line of defenses "The Green Line was supposed to be really something outstanding in the way of a defensive line, but it was never completed, and when we came back into it we thought the trenches mst have been intended to trap tanks, they were so wide! They were twice the width of a normal trench - about 12 feet wide - and they had no fire-steps. That was the first moment that I was frightened, really frightened, because the orders came along 'This position must be heald at all costs until the last man' Of course, what happeend was that, when daylight came on the morning of the 23rd, we had been outflanked and we were out in the blue. The order came to retire once again, which I must say was a great relief to me" By the 23rd, with the German troops continuing forward, and now 15 miles from their starting points on some areas of the front, Gough's forces were beginning to fall apart completely. Gough's army was beginning to lose contact with Byng on the left and the French on the right. On the 24th it was more of the same, with British falling back and the Germans following. Everyday in the morning the Germans would continue the attack until night fell, when try and rest to renew the advance the next day. The Germans ruled the skies over the battlefield as well, with one British Pilot, Lieutenant Rudolf Starck, being one of the British pilots who did get a chance to fly over the battlefield "Below us a battery is firing, infantry are advancing to storm. Columns take cover in trenches and behind rising round. Everywhere I see flashes--smoking, flaming mouths of cannon." While the advances continued, the Germans continued marching, and their pace would continue to increase. On March 26th they would make 9 miles, on the 27th 10, Operation Michael had changed, it was no longer a battle, it was now a chase. This was a great victory, but it was also starting to cause some problems for the Germans. To start with, the supply system behind the front had been setup under the belief that the largest advances would be in the north. Now with Hutier and his troops in the south now pushing deeper and deeper into enemey territory it was becoming harder to keep them supplied. The other two German armies under Below and Marwitz were also advancing now, which put an even greater strain on the German supply system. there was also the matter of where the armies were advancing, and on this question Ludendorf was quite indecisive. 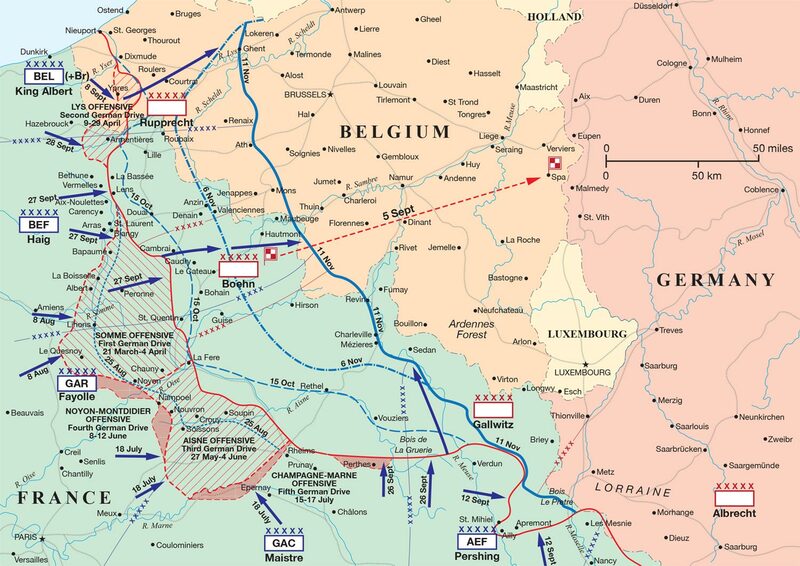 Below would be told to turn north, which was the original plan, Marwitz to drive directly west to a point between Arras and Amiens, Hutier would move to the south and toward Noyon. This represented a continual increase in the scope of the attack, spreading the German troops thinner and thinner as they advanced. Perhaps Ludendorff thought he woudl take these areas and by doing so decisively rend the front in two, or maybe even defeat the British altogether. But at the same time troops were already moving north for Operation Mars, what was being asked of the German army was growing by the day, a massive case of scope creep to put it in modern business terms. The one area that Ludendorff did not initially put much forucs on was Amiens. AS I mentioned in a previous episode the city was very important because it was a huge next of rail transport with a huge portion of British supplies for the southern end of their front going through the city. Something like 80 percent of all north to south rail traffic behind the British front went through the city, so it was obviously very important. However, it was not initially an objective of the German attack, and when the attacks were reorganized to focus on the south it was again not high on the German priority list. Ludendorff was still far more focused on taking Arras and beginning the process of rolling up the British lines. It is very possible that if the Germans had put more focus on Amiens, and given more reinforcements to Marwitz in the center the Germans could have taken the city, even as late as March the 23rd it was lightly defended. By the time that Ludendorff change dhis mind and made Amiens the primary point of Marwitz's effort French reinforcements had already began to arrive on the scene. While over the coming days attacks would be launched, by this point the attacks were beginning to bog down. This was due to a huge variety of reasons which we will discuss in detail next episode, but for now I will leave you with a quote from Leutenant Rudolf Binding who tells a story about one of the reasons that the German advance would begin to slow, and eventually come to a halt “Today the advance of our infantry stopped near Albert. Nobody could understand why. Our airmen had reported no enemy between Albert and Amiens. The enemy’s guns were only firing now and again on the very edge of affairs. Our way seemed entirely clear. I jumped into a car with orders to find out what was causing the stoppage in front…As soon as I got near the town I began to see curious sights. Strange figures, who looked very little like soldiers, and certainly showed no signs of advancing, were making their way back…There were men driving cows before them on a line; others who carried a hen under one arm and a box of notepaper under the other. Men carrying a bottle of wine under their arm and another one open in their hand. Men who had torn a silk drawing-room curtain off its rod and were dragging it to the rear as a useful piece of loot. Men with writing paper and colored notebooks. Evidently they had found it desirable to sack a stationer’s shop. Men dressed up in comic disguise. Men with top hats on their heads. Men staggering. Men who could hardly walk…When I got into the town the streets were running with wine. Out of a cellar came a lieutenant of the Second Marine Division, helpless and in despair. I asked him 'What is going to happen?' it was essential for them to get forward immediately. He replied, solemnly and emphatically, 'I cannot get my men out of this cellar without bloodshed'"